It feels like early June across the city of Houston this morning, with low temperatures only having fallen into the low 70s. 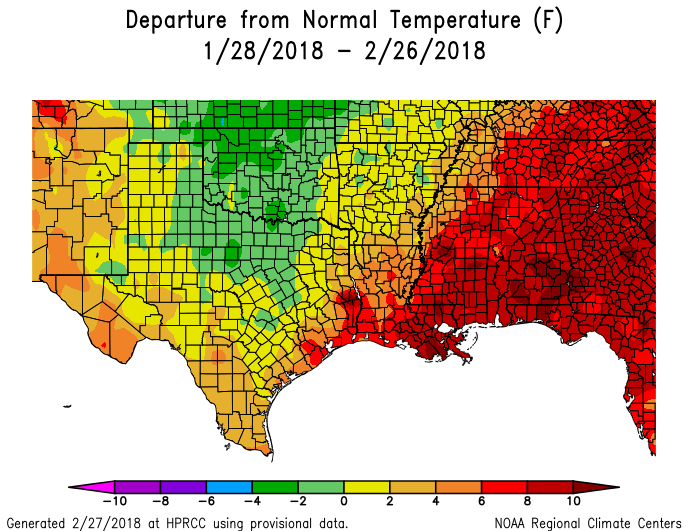 Indeed, February has been quite a warm month after the cold start to 2018, and most areas are going to end up between 5 and 6 degrees above normal temperatures for the month. We will probably end up close to, if not among, the top 10 warmest Februaries in the city’s history. The map below shows the departure from normal temperature map for the last 30 days, through Monday. Highs will reach the low 80s under mostly cloudy skies. We’ll see some brisk southerly winds as warm, humid air continues to move into the area. There’s a slight chance of showers for the northern half of Houston today, but for the most part I think the rain will hold off until a front moves through Wednesday night. The front, with a broken line of showers and storms, should sweep through the area between midnight and sunrise on Thursday, perhaps bringing a tenth of an inch of rain, or two. As spring fronts go, this one should be fairly mild. We’re still looking at some mighty fine weather to end the work week, with highs of around 70 degrees, partly to mostly sunny skies, and cool nights in the 40s up north, and upper 50s along the coast. Nigh perfect. I’m hopeful that we’ll still see a modicum of sunshine on Saturday, but certainly the clouds and humidity will be returning with the onshore flow from the Gulf of Mexico. Look for highs near 70 degrees, with a slight chance of rain showers during the afternoon and evening hours. For the most part, however, I’d expect outdoor activities to get along just fine. By Sunday, the onshore flow will have returned in full force, and we’ll see a corresponding increase in nighttime temperatures into the 60s (fortunately not the 70s again) heading into the new week. Rain chances return, too, and it appears that between Sunday and later on Monday or Tuesday, when the next front reaches the Houston area, we could pick up between one-half and one inch of rain. Or maybe not—the models are a bit hazy. After the front next week does look cooler, with nights down around 50 degrees or so, for awhile. Is all of this warmer weather likely to carry into March, and the rest of spring? Thank you for all of the great work you do! In about 10 weeks, it will be about a billion degrees outside again (sigh).